For my birthday we made a short trip to Florence. The excuse for visiting such an artistically relevant city was actually visiting Ferragamo’s museum: The Fancy Puffin never has holidays! 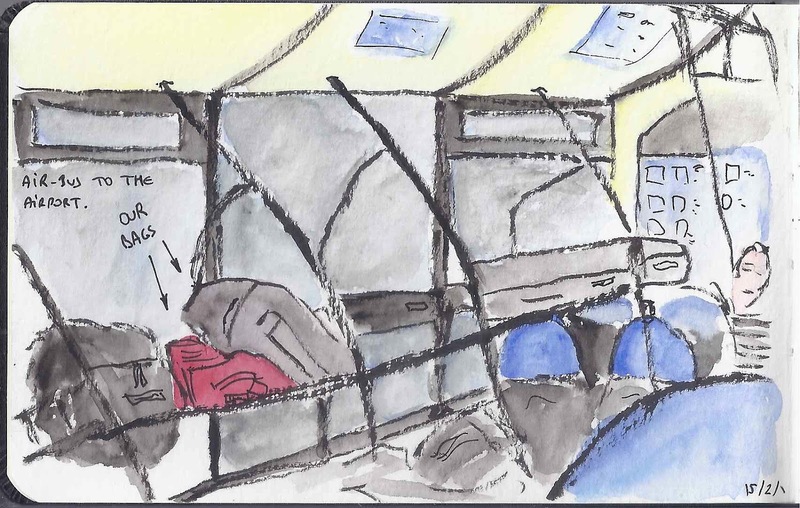 Our journey started by taking the train to Plaça Catalunya, where we took the "AirBus" to Barcelona Airport. Going by train directly to the airport is an option, but in the past we've seen delays that resulted in needing to take a taxi to the airport... which is quite a bit more expensive. So, airbus it was! Airbus ride. Pentel Calligraphy brush, Winsor & Newton watercolours with Pentel aquabrush. Since I always go to the airport with plenty of time, we took our time to eat something before our flight. A couple sandwiches and a bottle of water for the flight. Ready to go! Airport breakfast. Sakura Micron 0.1,Winsor & Newton watercolours with Pentel aquabrush (I won’t repeat this one again, if I use watercolours, I use it). 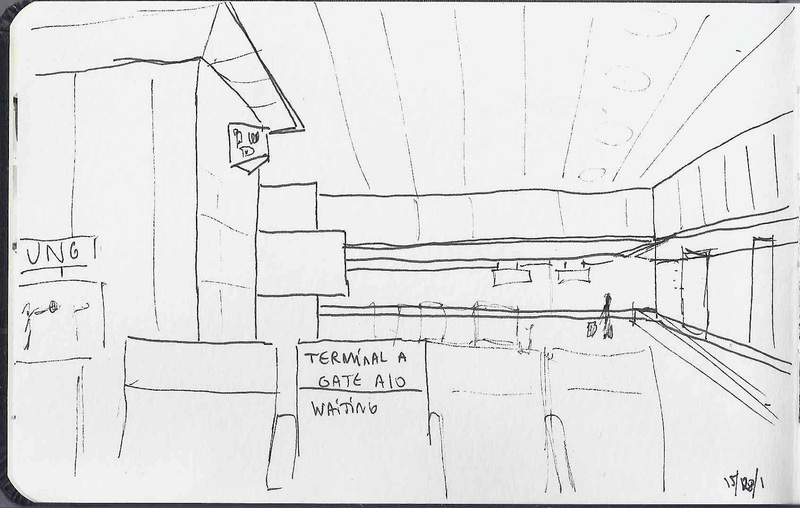 After eating we went to our gate, and I just had 5 minutes to draw this before boarding started. 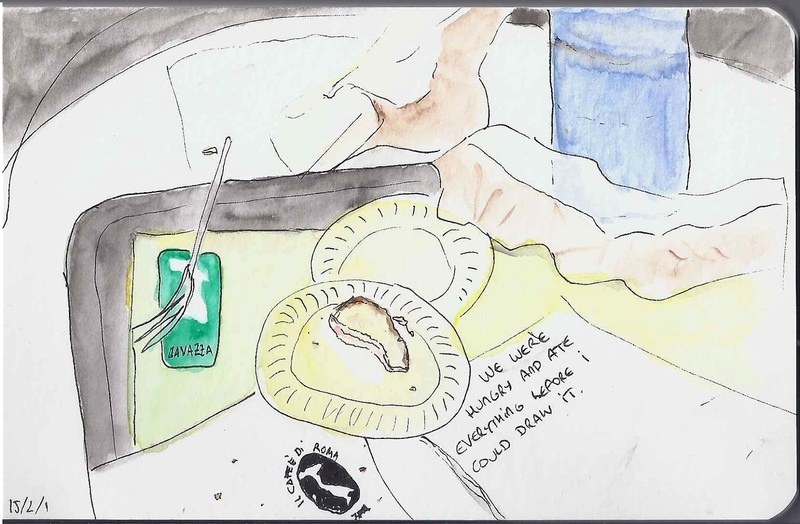 Once in Florence we went directly from the airport to our hotel, and on our way we found the place we wanted to go for supper: Osteria del Cinghiale Bianco. 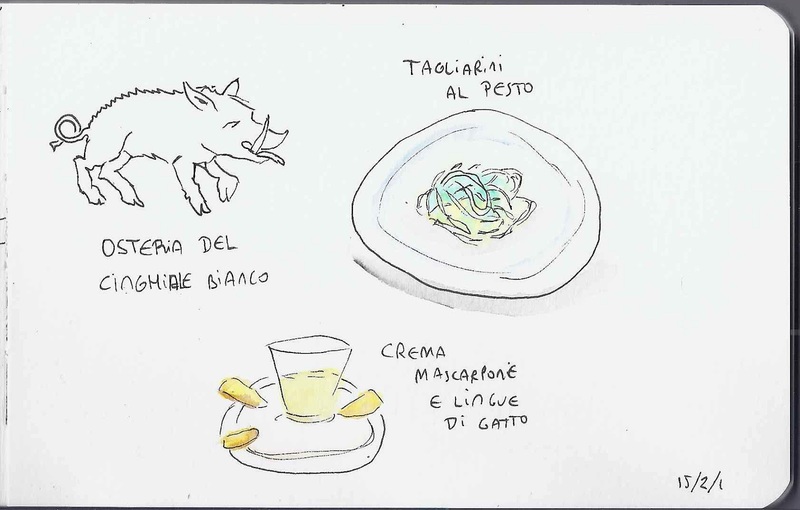 Boar is not only a typical dish in Florence, but also the "city animal." For this first supper we had cheese appetizers (awesome,) tagliarini al pesto (pretty good), tagliatelle with boar ragu (superb.) For dessert we had tiramisu (very, very good but I want it slightly sweeter) and crema mascarpone e lingue di gatto (mascarpone cream with cat tongue biscuits. This last one is absolutely the best dessert we have ever eaten. Seriously, if you go to Florence eat one for us here. 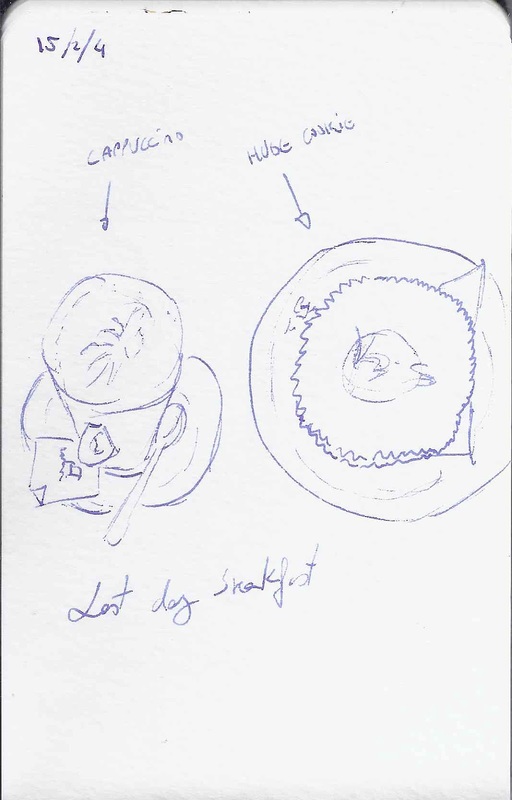 After dinner we went for a stroll, and as usualy I drew weird things I found around. 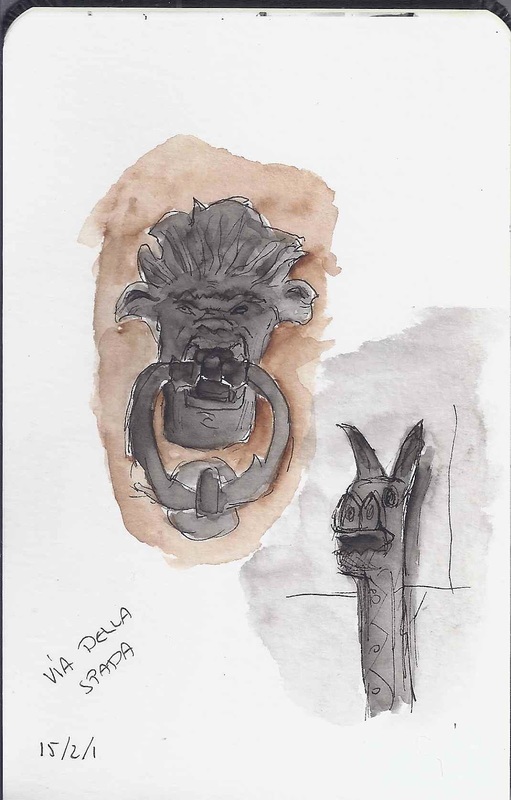 Doorknobs in Florence are forged, agey and beautiful, like this demon. In several places there were also horse-tying knobs in the shape of a donkey, or something that looks like one. Next day, we went to the Ferragamo museum and then for more walking. 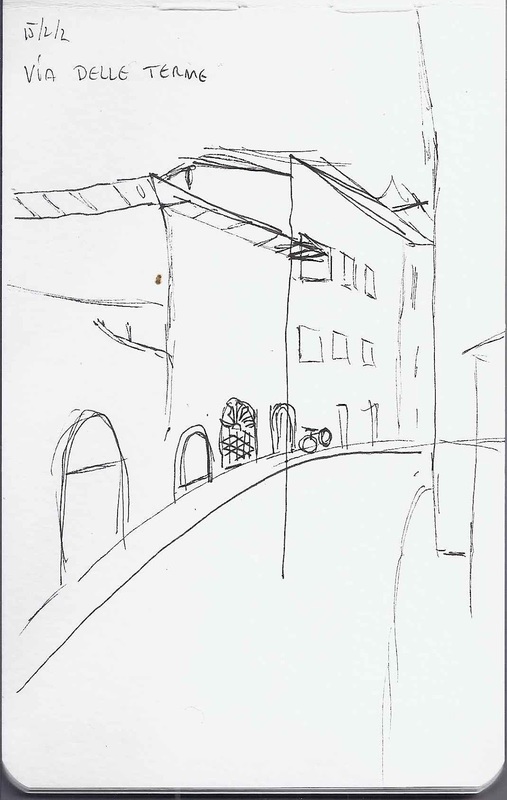 I wanted a "typical Florentine street drawing" but perspective still eludes me, so I didn't even colour it. 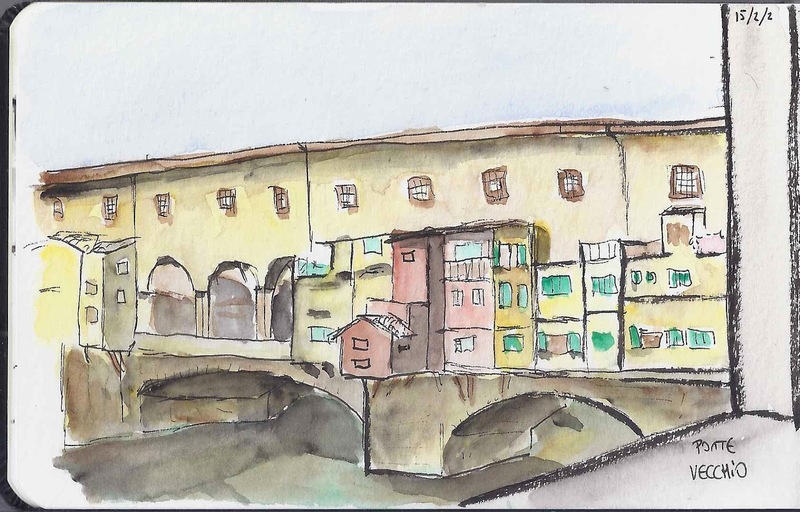 After lots of walking, we went towards the Ponte Vecchio (which was like 50 metres away from our hotel, by the way,) and I drew the bridge. 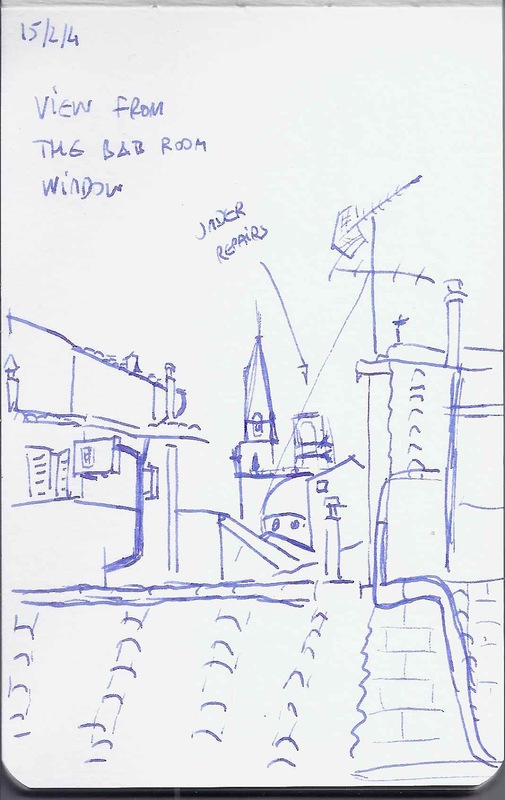 A couple italians passed by while I was drawing and said it was beautiful. I felt flattered. Our afternoon walks drove us towards San Miniato al'Monte. 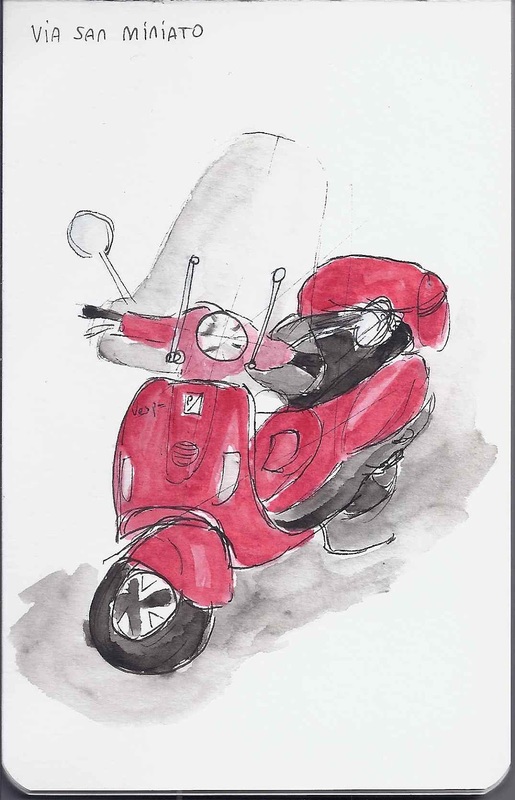 On the way I couldn't resist drawing a red Vespa parked so neatly. I couldn't get all the reflections before the driver came to pick it up, but I think the result looks pretty nice. Very Italian. Getting a brilliant red out of just watercolours is damn hard, by the way. Something like 5 metres away there was this mustard Vespa, and again I couldn't resist. This time I used brush markers to get a richer, faster colour. And again, the owner came before I was done! 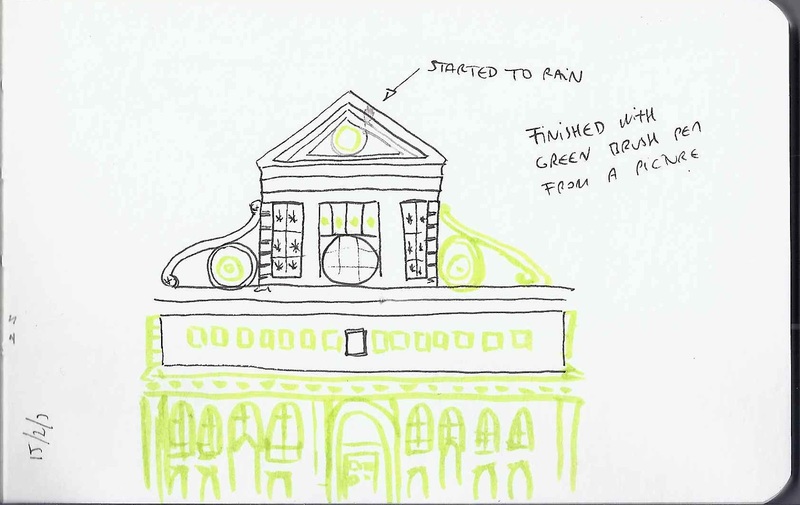 I got a compliment on the drawing, too. 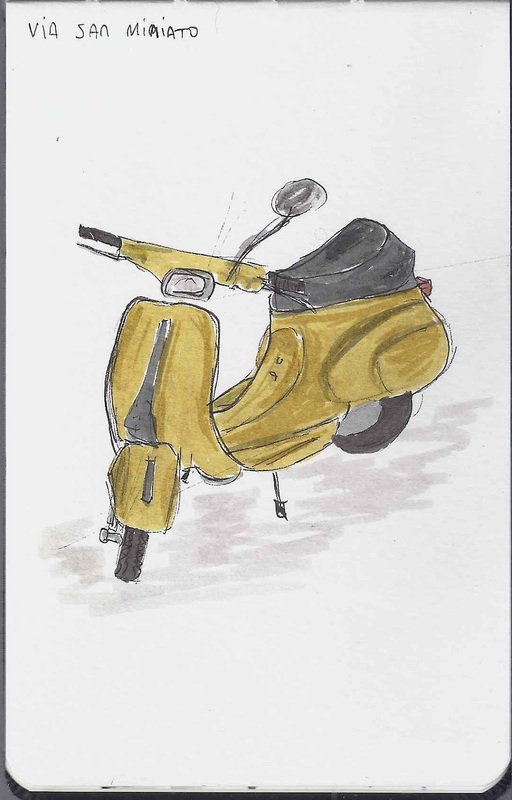 I like the red one better (the glass, specially) but I love the look of vespas in drawing. San Miniato al'Monte overlooks all Florence, so I drew a kind-of-map of the cityscape. Florence is a very charming city, but if you make the walk up be prepared. 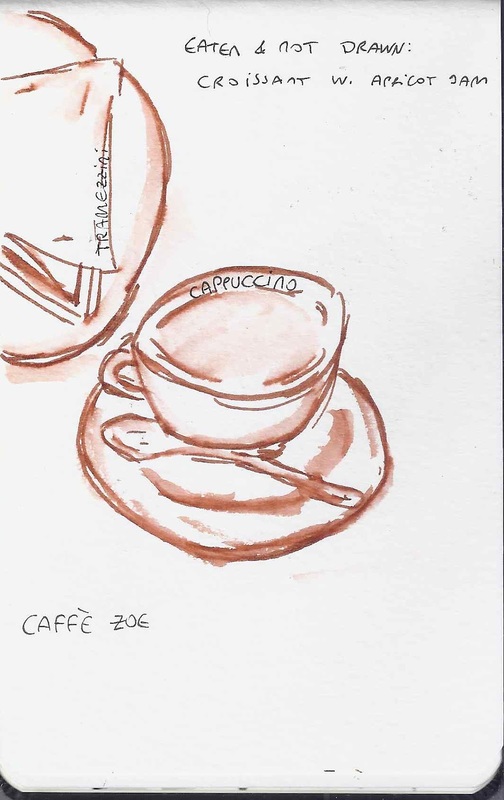 When we descended we stopped at a cafeteria and had a tramezzini (a kind of sandwich) and cappuccino. I experimented with some of the tools I had brought for drawing. The day after was my birthday, and again we went for a walk. I quickly drew a door forge. 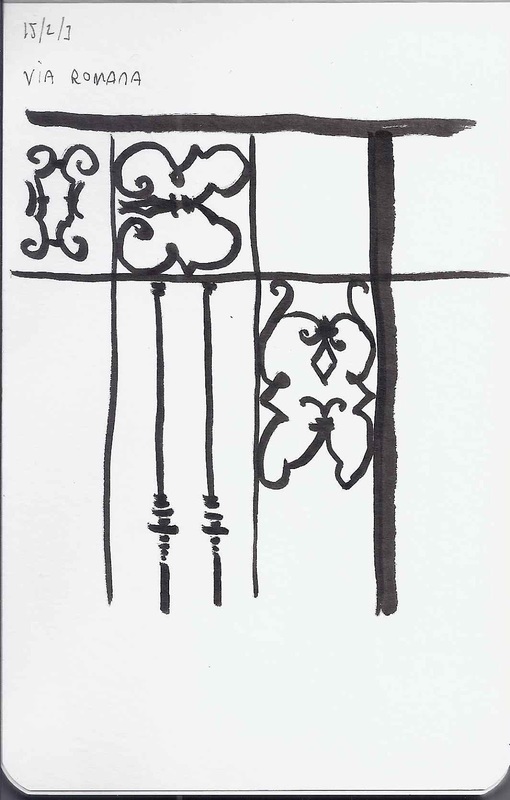 I love forged iron things. Back at the hotel I drew one of my birthday gifts. I have already read it, and it's awesome. 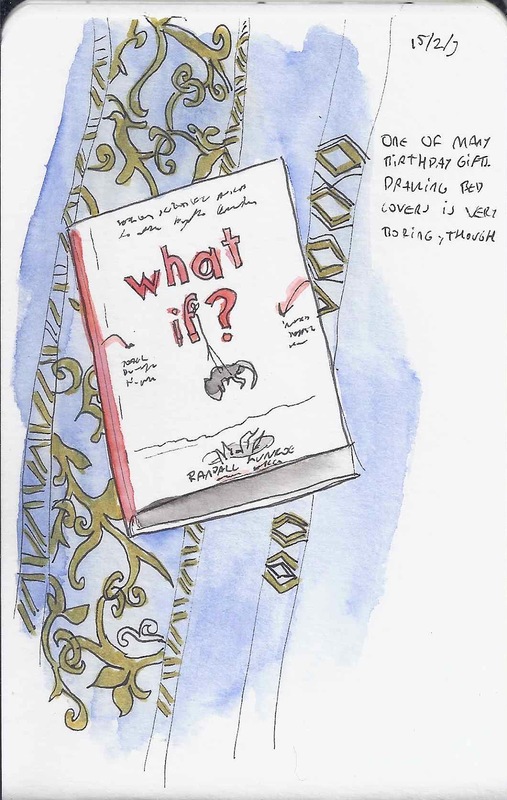 It is Randall Munroe's What If: Serious scientific answers to crazy questions. Munroe is a crazy genius. 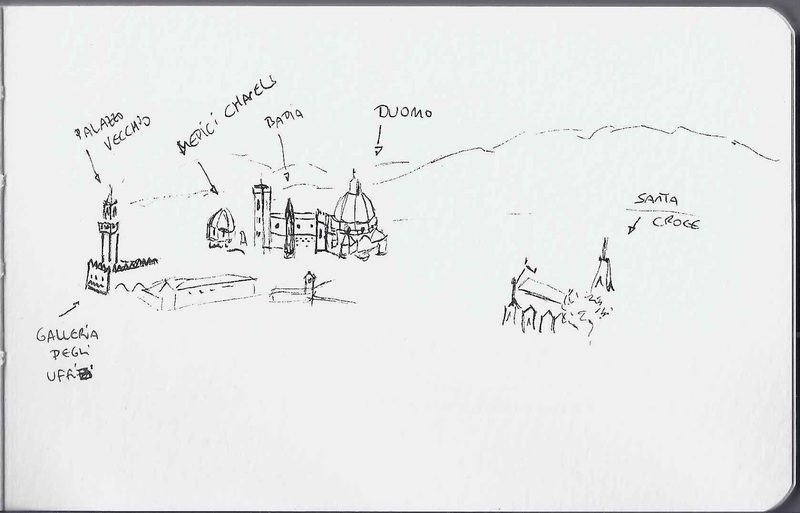 I felt bad for not having drawn Santa Maria della Novella, so we went there... I started drawing and then a light drizzle started. I could have kept drawing, since it was just a few drops here and there, but my pen didn't draw as soon as it hit water. Pity. 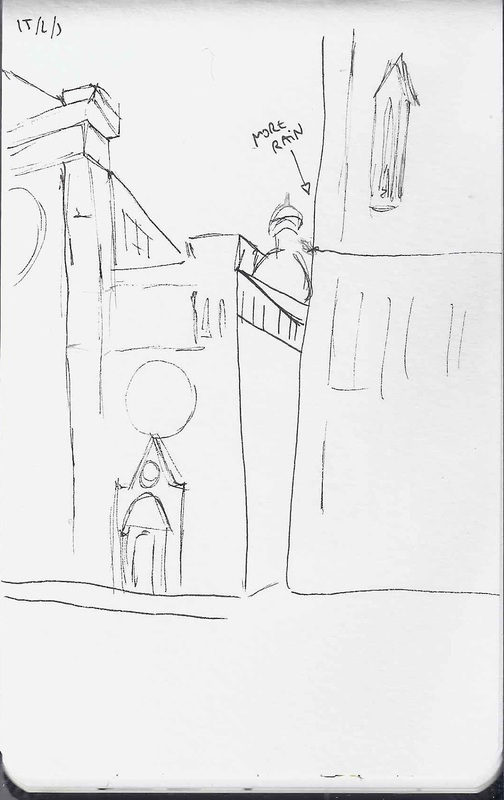 Likewise, we went towards the Duomo, I started drawing and rain started yet again. Well, at least I got some lines in place. I tried some distorted perspective, but I need way more practice. Time will give this. I purchased a Lamy Safari, medium nib at a bookshop. A pity it's blue ink, but at least I could start drawing with it right away. Our last breakfast in Florence. Huge cookie and cappuccino. The cookie was superb, and as usual, the coffee was most excellent. 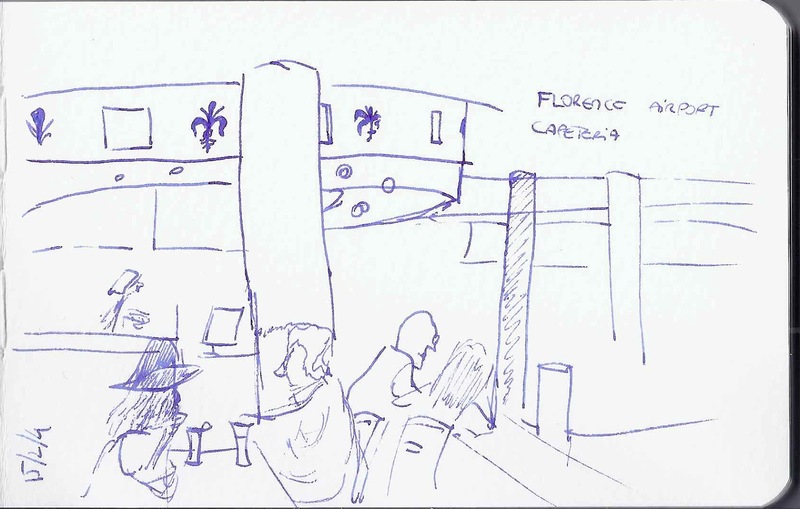 And the final drawing in Florence was another pen sketch in the airport cafeteria. Not great, but not that bad either! 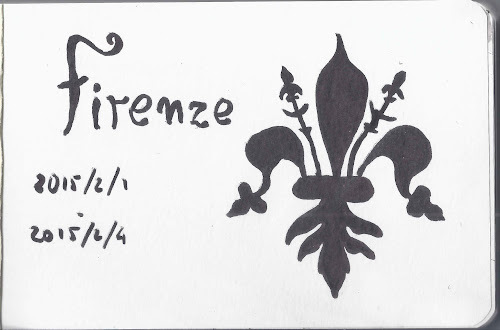 When we came back I drew the "cover" for the trip drawings with the Florence's fleur de lis.